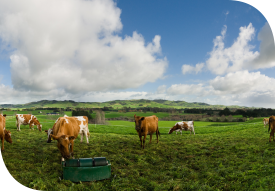 In what is traditionally the rural property market’s busiest season, farmer confidence in the dairy sector will be the critical factor this spring. Some dairy farmers reacted directly to the Global Dairy Trade’s recent positive movement, considering buying or selling land within hours of the auction. Many have held off on property for at least a year, waiting for the sector to emerge from its trough. With the auction showing this may finally be happening, the phones of rural property salespeople started ringing immediately with buyer and seller enquiry. For the three months to 31 July, Real Estate Institute statistics indicate dairy farm sales and values are holding steady. PGG Wrightson Real Estate’s dairying salespeople suggest farms are currently selling between ten and 15 per cent below their peak of two years ago. Even when returns are at their highest, there are always a few who need to sell property under bank pressure. At present, the number of forced dairy farm sales is no greater than it generally is. While that could change, farmers now appear likely to be rewarded for their considerable efforts to trade through tough times. As confidence rises, buyers and sellers should re-discover the conviction they need to agree on the value of a dairy farm. If so, a particularly busy spring awaits, as many proceed to make up for lost time. Buoyant exports are driving other sectors. Although the kiwifruit property market usually goes into hiatus in winter, this year sales have progressed at autumn’s record values of over $400,000 per hectare for green kiwifruit and around $700,000 for gold. Apple exports, meanwhile, are encouraging strong interest in Hawke’s Bay orchards, where values sit between $80,000 and $100,000 per hectare. In Marlborough, with viticulture exports on a high and winery expansion under way, the appetite for land keeps growing. Wairau Plains blocks are selling at around $180,000 per hectare, while a Rapaura vineyard sold recently in excess of $250,000 per planted hectare. With confidence in dairy possibly re-emerging, and going from strength to strength in other sectors, we can look forward to a lively spring rural property market.